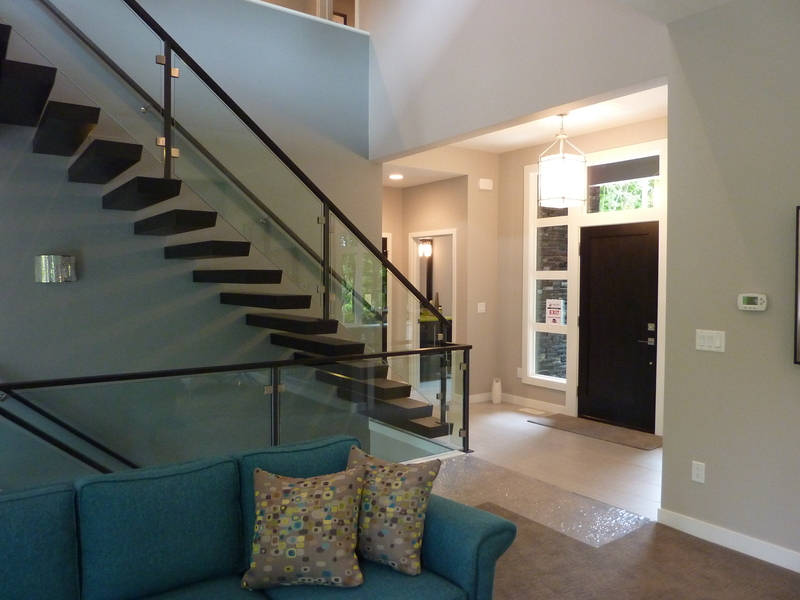 A few weeks ago, Kenny and I went on our local Parade of Homes. It was fantastic. 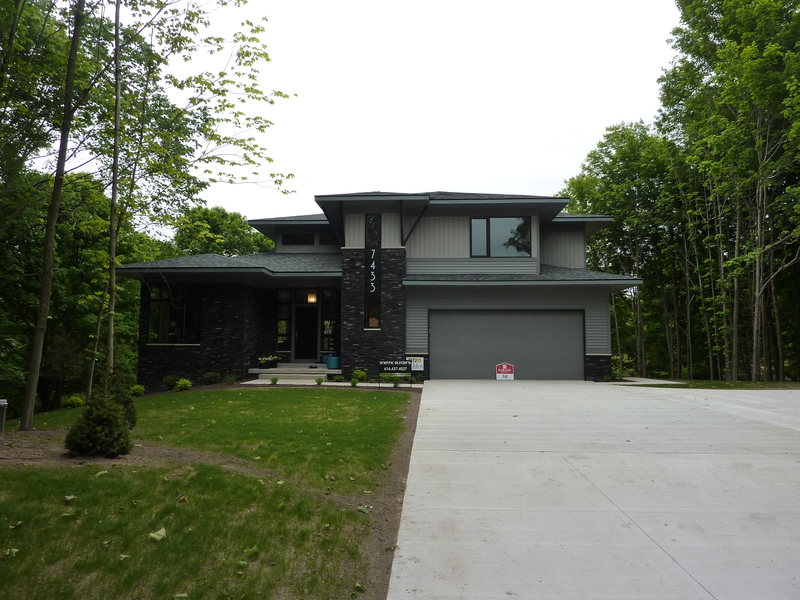 My favorite style of house tends to is usually pretty traditional/craftsman-y, but when I saw this sleek, modern house, I figured we should go check it out just for kicks. I actually really liked the outside. The yard? Fabulous. The backyard extended for a long way behind the house and there were lots of mature trees. When we walked in, we couldn’t help but smile. It was such a cheerful house! 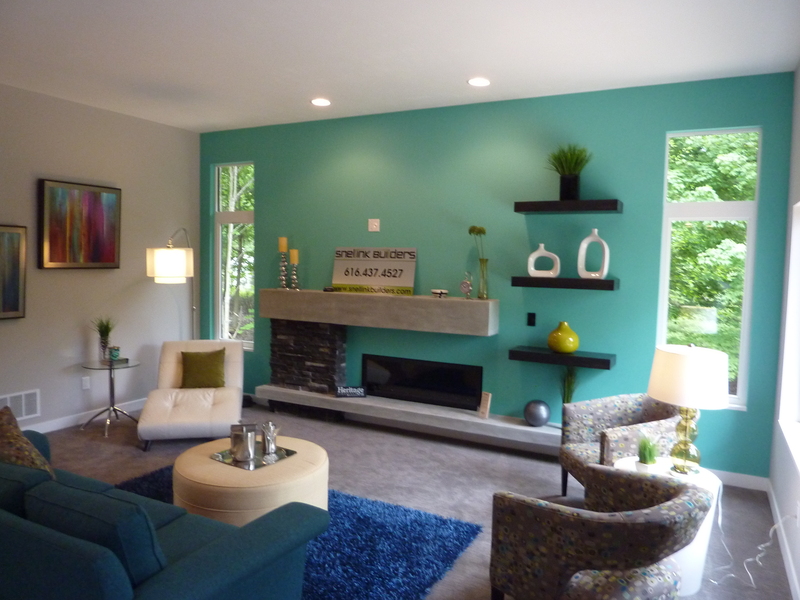 The livingroom was a bright aqua/teal and had a low fireplace and concrete mantle and hearth. The designer had also decorated with lots of brightly colored accents, which I (of course) loved. (Shaking hands were of course a factor in this blurry picture). Along the side of the fireplace just inside the front door was the most beautiful staircase ever. Each tread was floating from the wall and there was a glass and metal railing running up it. I was a little nervous to walk on those stairs thinking that at each step they’d collapse and I’d fall to a gruesome death, but I obviously survived. 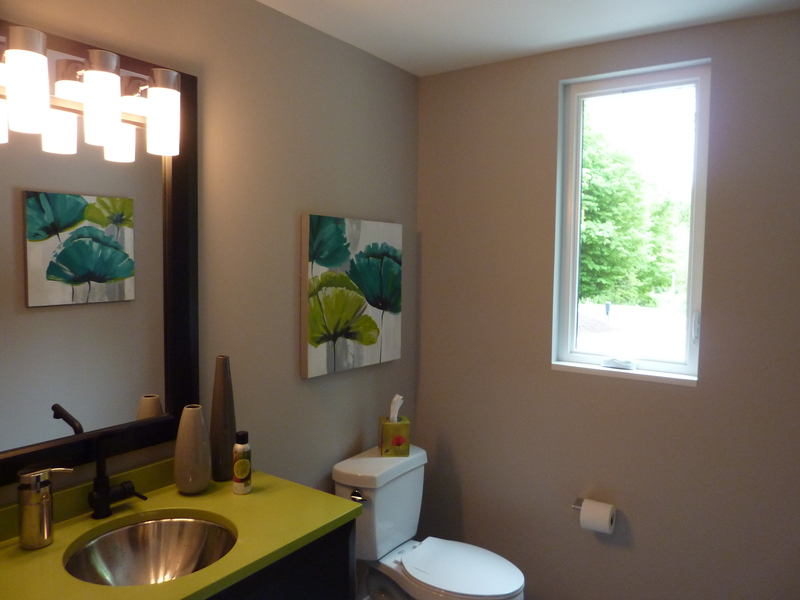 In the background of the picture above, you can catch a glimpse of this happy little bathroom with the bright green countertop. Who knows? The green counter might actually disguise piles of hair better and then you’d have to clean less. 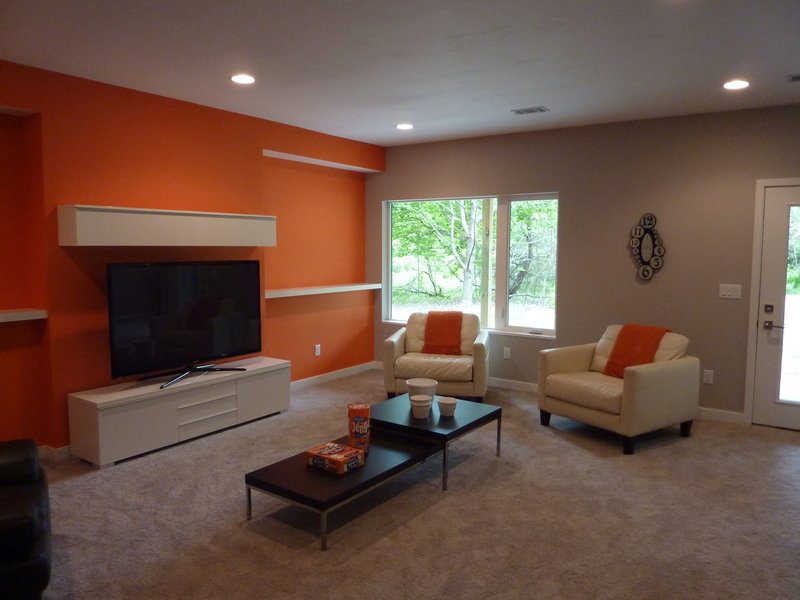 The basement was also brightly colored and didn’t feel very “basement-y” due to the high ceilings and walkout level. The “mantle” above the TV was actually where all of the TV’s electronics were stored. Smart, right? Under the stairs going down into the basement were these glorious shelves. I could see fitting a whole lotta IKEA in those cubbies. Upstairs there were a couple of bedrooms, a bathroom, and a master suite. 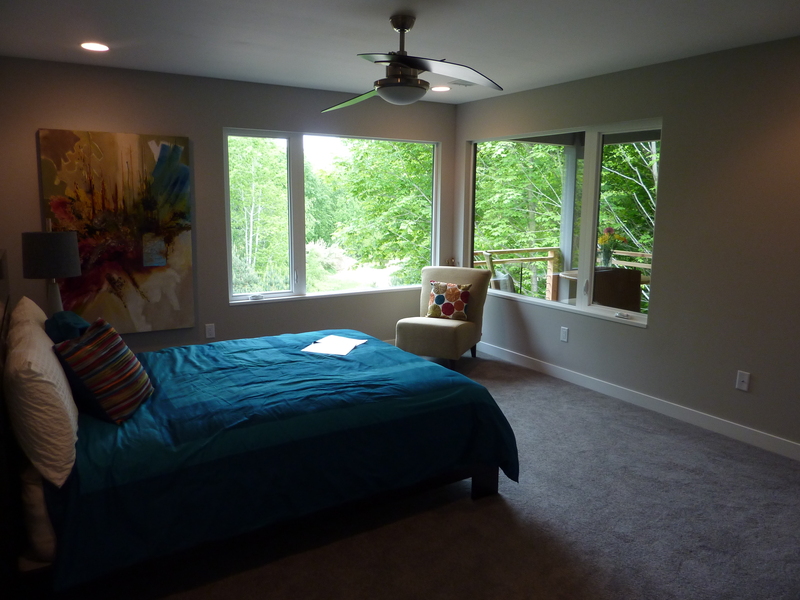 There was a master bedroom deck off this second level, and the views out the corner windows were pretty stunning! 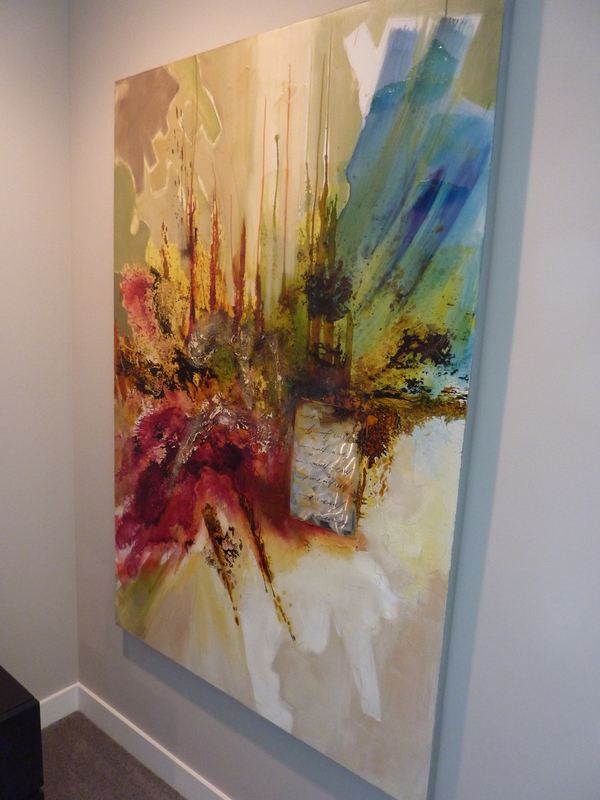 I had to take a close-up picture of the artwork in the master bedroom. Isn’t this awesome? I’m scheming up ways to DIY something like this but I’m afraid my attempts would look more like vomit and less like this inspiration picture. Both Kenny and I agreed that if we had to live in a more modern, contemporary home, we’d sacrifice and live in this one. I usually think that modern homes are to stark for my liking, but I think the wooded setting, huge windows, and happy colors of this home won me over. If I ever had to design a house, it would be a terrible mish-mash of floating staircases, antique oil paintings, vomit paintings, and half-finished projects, so it’s a good thing that it’s not in the cards yet. But someday….well, you just wait. To see our other house touring adventures, check out this Pottery Barn style house (huge) and this amazing nautical beach house (perfect). Dreamy sigh. 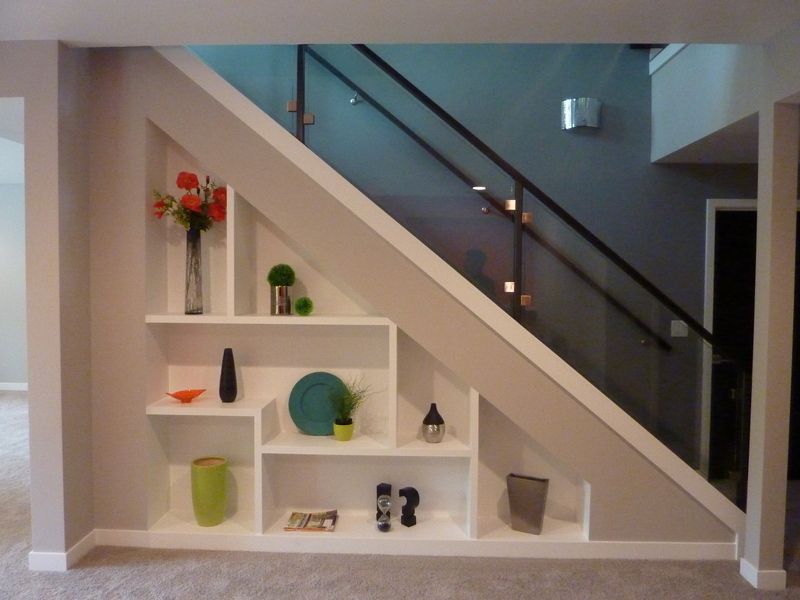 Categories: House Tour | Tags: contemporary house, floating stairs, ikea decor, modern style | Permalink. I don’t usually trend very modern, but this is stunning! Me neither (at ALL), which is why I was so surprised that I loved it! It made me snicker…my maturity level is going down as we speak. That is a pretty cozy example of modern. Some of those houses just look like the dentist’s lobby, which is not my favorite decorating scheme.